Religion and Politics in Bahrain: Pre-BICI Realpolitik: Can King Hamad Keep Bahrain Safe from Terrorists? Pre-BICI Realpolitik: Can King Hamad Keep Bahrain Safe from Terrorists? With only a week remaining before the unveiling of the BICI's final report (assuming it isn't postponed again), doubt and rumors about its substance continue to fuel a good bit of pre-release political posturing on all sides. 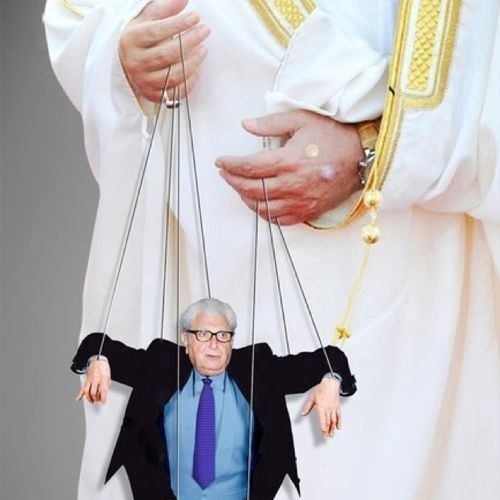 While many in the opposition continue to view the entire Bassiouni commission as a mere pawn of the regime--hence the nice photoshop to the left that someone passed along--others in Bahrain continue to give a much different impression. "There are certainly things that happened in the country that nobody is proud of. But we have an important report coming out on November 23 and that will really give us a narrative of the truth that we can accept and move on." The less moderate factions of the royal family and their friends in the press are far less sanguine about the likely outcome of November 23. Admittedly, this is helped in part by the plans of the February 14 coalition for a "Black Day of Anger"--black referring to the color of the smoke that will emanate from the large quantity of tires that they plan to burn in the middle of Bahrain's roads. Being ready for the report results and for the post-report period needs total conviction and modification of many concepts the first of which is the “amnesty” concept and the “waiver” concept which has become phobia to many people. And as soon as people hear of an arrested person being released, they get disappointed and think again that an amnesty and a waiver will take place. Yet, if this is the official media line, recent government actions would seem to betray a much different calculation, and certainly not one premised on BICI exoneration. I refer of course to the state's most recent "terrorist cell" break-up, the convenience and vagueness of which invites a repeat of my article from March: "Sound Familiar? More Terrorist Plots." 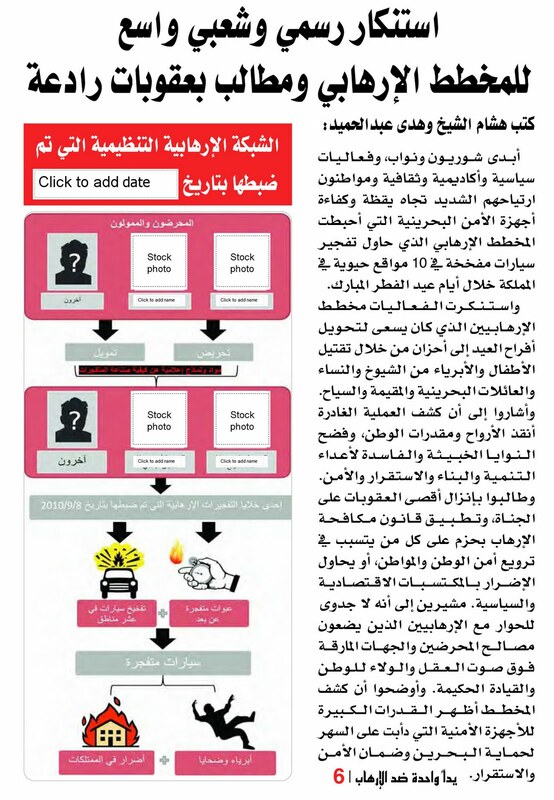 In fact, I have done the government the favor of creating a terrorist flowchart template for use in future busts, based on the famous Al-Watan version referenced in the previous link. It simply requires the entry of a new date, new names for the "terrorists," and some stock photos. Then you just hit PRINT and--bam!--another terrorist cell has been dismantled. A curious thing about this most recent cell break-up, however--apart from the fact that, as the Guardian reports, the BNA's official announcement "gave no further information on the suspects or other details to support the allegations"--is that it would seem to contradict another of the Bahraini government's positions: namely, that the opposition's activities inside the country, not least the February uprising itself, are choreographed by Iran. For why, then, would these terrorist suspects attempt to travel to Iran (via Saudi, Qatar, and Syria, supposedly) in order to organize a cell that would then RETURN to Bahrain (somehow) to carry out attacks? Indeed, if the government is correct in its claims that the opposition has secret arms caches and training from Hizballah and/or Iran, why don't these armed, trained "terrorists" who are ALREADY IN BAHRAIN simply carry out their attacks? "Oh no, a crowd of obviously non-Bahraini Khomeini supporters! This article and its implications must be true!" Finally, there is today's news that investigators analyzing Bahrain's newest terrorist cell have uncovered a "hit list" that apparently includes such high value targets as BTV news anchors. 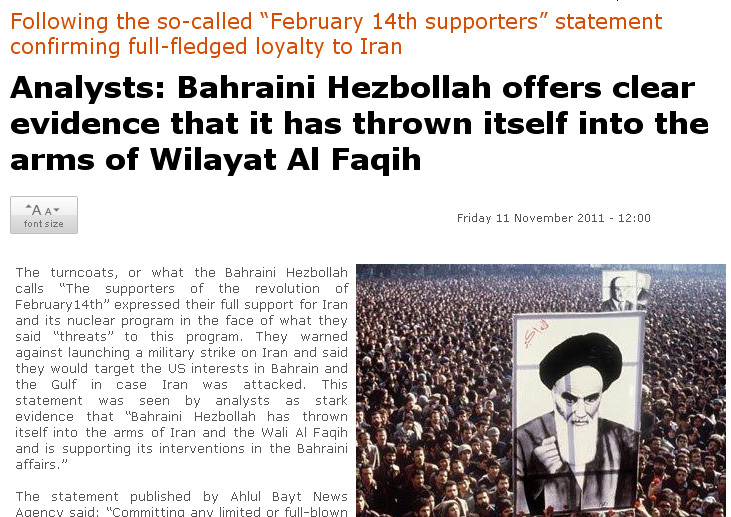 One hopes that such revelations do not introduce some bias into the station's coverage of events in Bahrain! More seriously, the substance and timing of this "terrorism" onslaught cannot be unrelated, one suspects, to the anticipation surrounding the BICI report. Certainly, Bahrain's terrorist "bust" was announced amid the IAEA report on Iran's nuclear program and the attendant saber-rattling. But the intended audience seems to be domestic as much as international. The lesson: Bahrain faces real and growing internal and external threats, and the state needs to take more decisive action to guard against them. "[b]eing ready for the report results and for the post-report period needs total conviction and modification of many concepts, the first of which is the concept of 'amnesty' and 'pardon,' which has become phobia to many people. And as soon as people hear of an arrested person being released, they get disappointed and think again that an amnesty and a waiver will take place." Previously known as one of the best destinations for expats and the financial hub of the Middle East, 'Business Friendly' Bahrain is now rocked with sectarian-fuelled tension and violence and has become a place to avoid, with main highways routinely blocked with oil slicks and makeshift barricades. I would like to examine whether the King and, perhaps more importantly, his advisers can repair the damage. Very few would doubt His Majesty King Hamad's sincerity and genuineness. All who meet him are struck by his openness, kindness and true passion to do the right thing for his people. The question is: does he have the right people around him, right advisers to put Bahrain together again? The future for Bahrain shouldn't be in the hands of the King's advisers alone. Voices from all segments of Bahrain's society need to be involved in the healing process and in this regard it would seem more beneficial to implement recommendations of National Dialogue - recommendations which emanated from a wide representation of Bahrain's society, not just advisers. I am confident that Bahrain will get back together again, but it needs more than the King's advisers to do this. In short, if the BICI represents--at least in no small part--an attempt by the king to regain some of his political influence shed over the previous 8 months, as I have discussed, then it is clear that his competitors are wise to the game, and are not content to take its intended result lying down. And protesters, in their continued acts of annoyance and road sabotage, are inadvertently aiding the cause of these less compromising Al Khalifa factions. The latter's aim is--and has been for some time--to paint a picture of a bleak security situation compounded by a king too indecisive and too weak to resolve it. How, then, can the state--more precisely King Hamad--punish (by BICI recommendation) precisely those individuals who did and continue to help most in keeping the country safe--officials in the police, army, and power ministries? The answer being pushed by Bahrain's hawks within the ruling family and within the population more generally is: he can't. At stake in the BICI final report is not simply Bahrain's international reputation, but its internal distribution of power. On November 23 and the days that follow--including critically the state's handling of the politically-charged Shi'a religious festival of 'Ashura' which will begin only a week later--we should have a much clearer indication of precisely how that intra-Al Khalifa struggle has played out. Update: Another doozy from Al-Watan: "November 23: the cemetery of woes and knowledge." Update 2: New video evidence has emerged showing Bahrain's Iranian-backed terrorist cell in action! Update 3: When can we expect the next BICI report to investigate police conduct during the writing of the first report? Bahraini authorities have given up on the "these bullets/cars don't match the ones on record with the Interior Ministry" excuse and are now using protesters' own tactics against them, claiming that the driver of the police vehicle that ran over this weekend's victim lost control due to oil poured on the road by demonstrators, on the face of it a not unreasonable explanation. 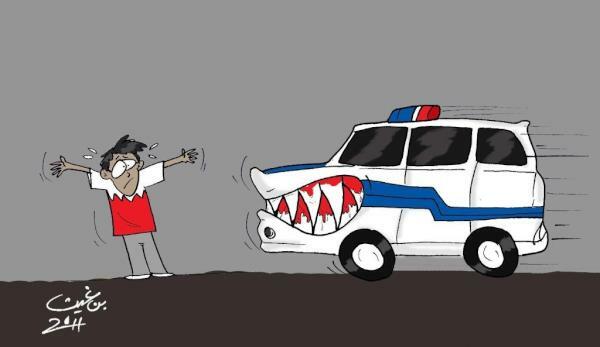 Update 4: The following timely cartoon is said to be from a Kuwaiti newspaper, though I can't find the source. I think the author forgot to draw the oil slick causing the rabid car to spin out of control, not to mention the AK-47 concealed by the violent "rioter." Also timely is this article from Global Voices, which asks: "Bahrain: Are Police Cars Running over Protesters on Purpose?" Update 5: A day before the BICI report and/or the "Black Day of Rage," Anthony Shadid writes in the NYT: "Bahrain Is Nervously Awaiting Report on Its Forgotten Revolt." And Bahraini human rights group have attempted to preempt Bassiouni's commission with a report of their own, to be released today. Finally, U.S. foreign policy leaders have sent a letter to Clinton urging her to push reforms in Bahrain. "Ali Yousif Ali Hassan, 16, died on the spot after he was caught between a police patrol jeep and a house wall behind him during the chaos, Interior Ministry spokesman Brigadier Tariq Al Hassan said." The contempt, hypocrisy, and deceptions of this country’s rulers is beyond description and one of a kind. Where else in this day and age would the king , Prime Minister and Crown prince exchange cables of congratulation and patting each other on the back on the occasion of receiving a commission report that incriminates them for violation of Human Rights , torture , killing , unlawful acts, promotion of hate amongst the people through official media channels , using of excessive force against pro-democracy protesters amongst many other offenses and violations but falling short of mentioning the undeniable fact that this government systematic practice of extermination and marginalization of shia majority. ? If you believe any word of what the king has said and promised in his response to BICi, you would believe anything . This is the same king that apologized for the killing of protesters in Lulu Roundabout in February and a few days later his troops killed even more protesters at the same spot with the help of Helicopter gunships and armies from Saudi Arabia. There is no question that Bessiouni and his commission has done a pretty remarkable job , but far from perfect. Only the naive will believe the King, The Prime Minister, Alkhalifa Family with the support from their masters & protectors, the Al Sauds and Anglo - Americans Governments, will embark on true process of national reconciliation , conducting of fair trials of those responsible for human rights violations , those criminals responsible for killing of innocent civilians and all other promises that the king has mentioned in his speech. It is NOT going to happen. This is just a smoke screen as the government and the insincere king is buying time and perhaps seeking some support to oust his wily uncle , who is obviously the target of this report and the biggest loser, to gain more control. The citizens of Bahrain will always be treated according to their allegiance to the Family and forget about something called democracy and elected governments. BICI Final Report: What Now?